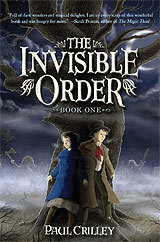 Book review: "The Invisible Order, Book One: Rise of the Darklings"
This review first appeared in Turbula in October 2010. Equal parts X-Men and Harry Potter, the first entry  "Candle Man"  in Glenn Dakin's new juvenile fantasy series, "The Society of Unrelenting Vigilance," is a solid story with interesting characters, intriguing locales and lessons learned. More polished than, say, the old Hardy Boys or Nancy Drew mysteries, but not nearly as fleshed-out as J.K. Rowling's Potter series, "Candle Man" concerns a young teen named Theo  who lives the life of a prisoner, confined to his room in a London mansion, raised by Mr. Nicely and Dr. Saint, who assure him he suffers from a rare disease that requires he be sequestered from the world. It turns out that Theo suffers not from a disease, but rather is gifted with supernatural powers  and that two secretive societies are battling over him. Secret underground passages, creative steampunk technology, magical creatures and an ancient legend all combine to lead up to a nicely consructed climactic battle (which clearly sets the stage for the pending second book in the series). As with other recent juvenile titles, though, the narrative flow is rushed at times, the characters not fully developed  at least compared to classics, such as the Potter series, J.R.R. Tolkien's books or the Narnia set from C.S. Lewis. But it's an entertaining read, likely to appeal to older pre-teens.